In addition to the attractive detectives solving the weekly crime mystery, Hawaii is the shining star of the CBS hit TV series Hawaii Five-0. We may never know the influence the show has had on Hawaii tourism, but every Monday night, the show highlights Hawaii’s beauty — enticing viewers to visit. The vast majority of scenes are filmed on Oahu, where the Five-0 team is stationed in the tropical metropolis of Honolulu. I love playing my own detective role with each episode by trying to determine where Hawaii Five-0 scenes are filmed. In fact, sometimes I find I’m more interested in the scenery than the story line. 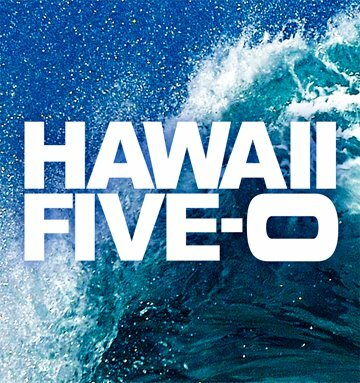 I’ve put together this list of recognizable filming locations for fellow Hawaii Five-0 fans to explore as part of their Oahu vacation. 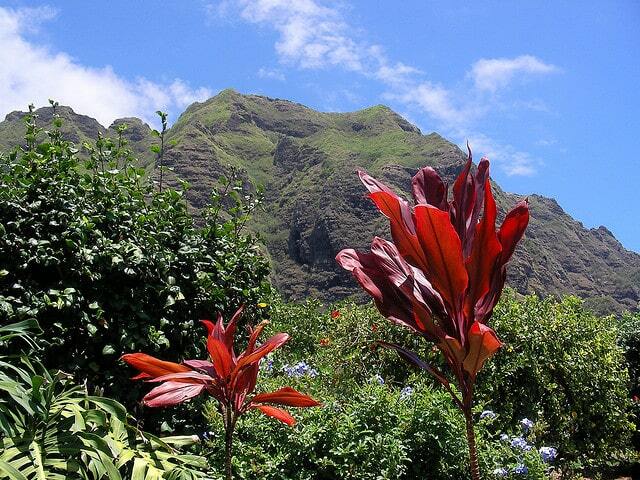 Many of the jungle and mountain scenes are filmed at Kualoa Ranch on windward Oahu. (See this map for the exact location.) The ranch has been the site of many television shows and movies, such as LOST, 50 First Dates and Jurassic Park, to name a few. The ranch offers a movie set and ranch tour that’s roughly an hour-long. Read our review of this tour. Kualoa Ranch is nice to see, regardless of its television and big screen fame. 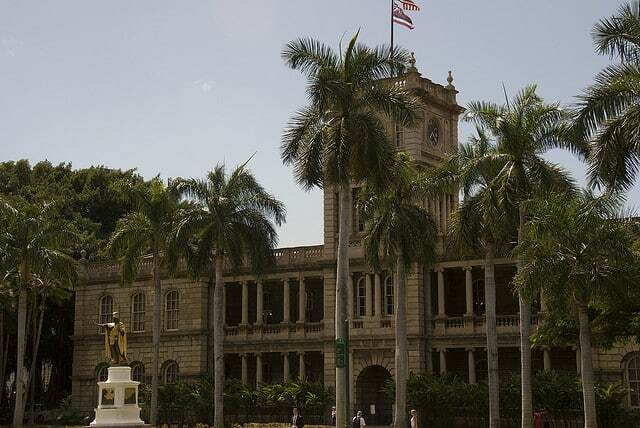 Historic Iolani Palace and Ali’iolani Hale are located near each other in downtown Honolulu. In the show the exterior of Ali’iolani Hale is shown. This building is the headquarters for the state of Hawaii’s judicial system. You would probably also recognize the statue of King Kamehameha in front of the building. This longstanding Waikiki hotel has been the backdrop for many scenes. (See our post with photos and video of Hilton Hawaiian Village.) When the team meets up for dinner, usually it’s at the oceanfront Tropics Bar and Grill, though I’m not sure how recognizable it would be. Do you recall the episode when Chin was grieving the loss of his wife and he was sitting on the beach and Danno joined him? That was shot on the beach just outside of Tropics Bar and Grill. The rest of the team were dining in Tropics while Danno and Chin had their conversation. Perhaps a more recognizable filming spot near Hilton Hawaiian Village, is where Kamekono parks his shrimp truck. It’s near the ocean side of Kahanamoku Lagoon. I believe the shrimp truck is only onsite just for filming, though. The scenery should look familiar. The following photo shows Rainbow Tower of Hilton Hawaiian Village. 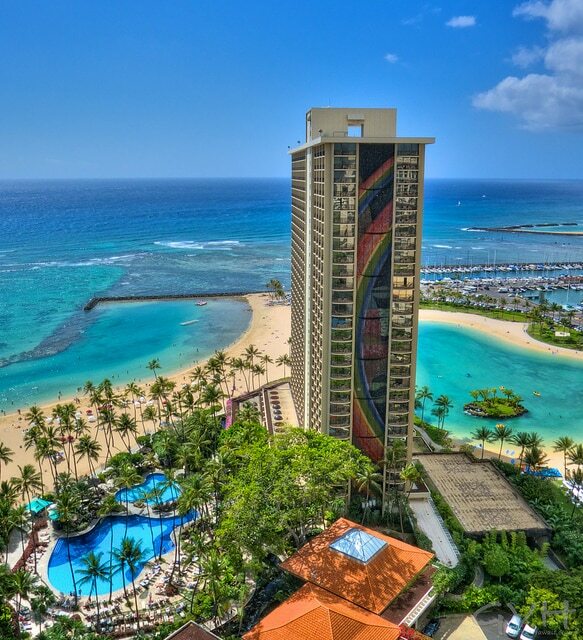 Kahanamoku Lagoon is located on the right side of Rainbow Tower. The shrimp truck scenes are filmed near the top sliver of sandy beach just to the left on Rainbow Tower and near to the rock wall that’s built into the ocean. 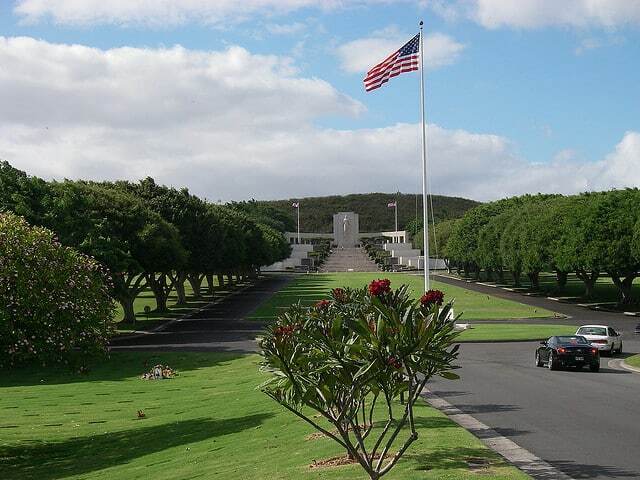 Many of the show’s funeral scenes are filmed at the National Memorial Cemetery of the Pacific, which is also known as Punchbowl. Steve McGarrett’s father’s grave site is set here. We recommend that you visit this site regardless of your interest in the television show. It’s a beautiful and moving place to visit. See our post on visiting Punchbowl. Though Leonard’s Bakery and Liliha Bakery haven’t been the sites of filming, their food has been featured. See Hawaii Five-0 has great taste in bakeries. During the first season, we shared these eight myths of Hawaii Five-0. A great article. I love this show. I hope to be able to visit some of these place when I’m in Hawaii next year. Hopefully, I’ll get lucky and they will be filming when I’m there! Enjoy the current series but I’m old enough to remember the original, though I saw that in black & white! Love the pictures and it is good to get some background information on the locations. I passed by there today. The security crew positioned near the street were far from friendly. We are not privy to the filming schedule. That type of information is kept under wraps. The filming production doesn’t want an audience on location. Our best advice would be to check each of the locations listed in this article and ask around while you’re there as well. Good luck! Yesterday my wife and I got our pictures with Scott Caan. Five-O was filming by Kahanamoku Lagoon and he was gracious enough to pose. Put the pics on my Facebook! The show is still being filmed in Hawaii. They keep tightlipped about their filming schedule so as not to attract a crowd. Ask around while you’re on the island. I live in Hawaii sometimes you do see them filming! Happy anniversary today! I’m currently visiting Oahu and saw signs (incognito) where they were filming today and wanted to go so badly, but they had security all in place. Hello there guys i will be in Hawaii 13th of August any idea of how can i find the 5-0 cast?? I will be in Oahu staying in Waikiki November 21 and 22. Any idea if I can get a glimpse of Alex O’Laughlin? Is the island in Episode 7 Season 6 a real island? If so, what is the name of the island? Dave – it’s Oahu. They tried to make it look like another remote island, but we believe it was filmed around the Kualoa area of Oahu. There’s not an uninhabited Hawaiian Island of that size and with that jungle-like terrain. Thanks. That’s what I expected. What about the snorkeling scenes? They were incredible. Any idea where they were filmed? No idea on the snorkel site. Honestly, I doubt that it was all filmed in Hawaii. We’ve snorkeled all over Hawaii and we’ve never seen some of the fish that were in the show last night. Too bad. I’d love to snorkel there. I think it was a fictitious spot. That’s the magic of television. The 01/08/2015 episode showed a hotel that they claimed was on Maui. 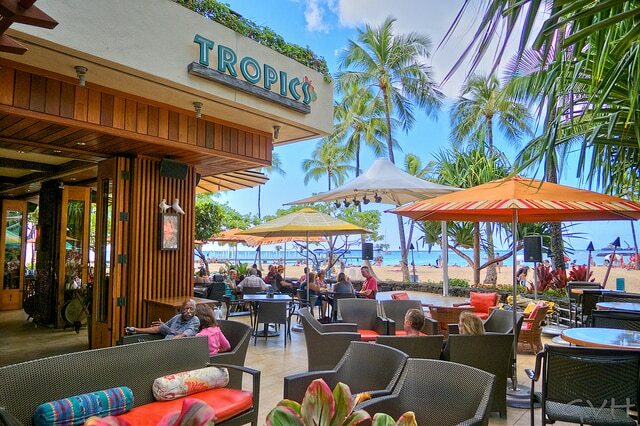 To me it looked like the Kahala on Oahu (formerly the Kahala Mandarin, I think). Can you confirm the “luxury resort”? Mahalo. We’re pretty sure it was the Kahala, too. What is the hotel they were at for Carol Burnett’s wedding & the funeral ceremony Friday? The Royal Hawaiian in Waikiki Beach. Does the food truck actually exist? Or is it anywhere you can actually see even if it’s not a functioning food truck? Thank you for this guide. I was awarded a special fellowship to the East-West Center back in the day and spent 3 months in Hawaii. It is a lovely, special state. Any idea where the “exploded” building in tonight’s (1/13/2017) episode is located? My guess is that it was actually a building under construction, dressed to look like an explosion had occurred. That was our guess, too. I think the explosion we saw was some kind of computer generated scene. Great show and episodes just keep getting better!! Wish they would redo the 70’s Tasty Chop Seuy Film Location. Great story. My fav from both series.. The show does not announce when and where they will be filming. They don’t want to draw crowds. Actually, they do by closing roads so they can film Just been watching filming here. They had signs up telling people what is going on. That’s awesome that you’ve gotten to watch filming. How exciting! Just to clarify my point…. they don’t widely advertise when and where they’ll be. In your case, you were lucky that they happened to be were filming where you are and while you are visiting and that they gave warning that gun shots in Waikiki were not real. We’ve read that there’s going to be a remake of Magnum PI! I wonder what they’ll do about the Robin’s Nest as that estate was demolished this week, sadly. There are too many good shopping places to mention; trust me, you’ll find them. The answer to your second question is —YES everything about Hawaii is VERY expensive —but, SO worth it ! I might have a chance to go this year! I’m 12 and I LOVE the show. I’d be going in June for my birthday and there would be nothing better than being able to meet them. We don’t have much money so it might not happen. Please pray that I will make it! I am going to be there in 2 days! So excited. I definitely will ask around the island to see if they are filming. My wife and I are celebrating our 25th anniversary on Oahu in May, 2019. I’ve been blessed to visit that beautiful state on 4 occasions. The first; US Army, Schofield Barracks, the second and third were business get-aways and the 4th was celebrating our 10th anniversary. We’ve been hoping to see one of the sets for Hawaii Five O. This site has given us some good ideas.